Diabetes mellitus is a disease characterized by the occurrence of excessive amounts of sugar in the blood (hyperglycemia). It is therefore a disorder of metabolism of sugars (carbohydrates). Generally, this disease can occur at any age and affects both sexes. The disease can break out suddenly, or it may find primary care physician at the preventive examination, and blood tests. The diabetes is in case the blood glucose level exceeds 10 mmol / l. Elevated blood sugar levels can have 2 causes a divide them by diabetes mellitus type 2. Type 1 diabetes most often erupts in childhood or youth, and it is actually an autoimmune disease where the body’s own immune system destroys cells in the pancreas that produce insulin. This disease is sudden and sometimes referred to due to the early occurrence as juvenile diabetes. 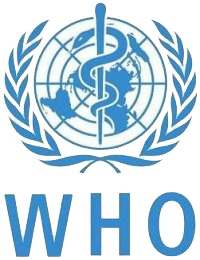 It is estimated that the current population suffers from this disease 0.4% of people. Type 2 diabetes is more likely in adults, particularly in obese individuals. Erupts gradually usually after 30 years of life, but recently also unusually occurs frequently in obese children with lack of exercise. Aptitude for this disease is often transmitted hereditarily from generation to generation, and now this disorder affects approximately 7% of the population. A special phenomenon is the occurrence of diabetes during pregnancy. It occurs in women who have never had similar problems, and postpartum subsides. This is most likely related to pregnancy hormones, which increase the demands on the function of the pancreas. When the pancreas fails to increased demands for insulin production offset, wide fluctuations in blood sugar levels. This phenomenon is typical for about 4% of pregnant women and is usually detected by a blood test for routine checks. Born children tend to have higher birth weights and are often at risk of low blood sugar (hypoglycemia) and neonatal jaundice. For type 1 diabetes risk factors are not fully known, it is likely to require a certain genetic predisposition, along with the penetration of viral infection. The emergence of type 1 diabetes therefore not related to the physical stature (whether a person is obese or lean), nor to everyday habits. But for type 2 diabetes is such factors several. Most often these are obesity, lack of exercise andan unhealthy lifestyle and diet. Long overeating and lack of exercise would reduce the number of insulin receptors on the cell surface. 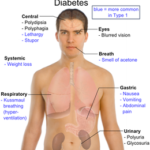 Earlier the type 2 diabetes referred to as maturity onset diabetes mellitus, as occurred predominantly in the elderly. At present, however, due to our lifestyle almost epidemic in all age categories and annually kills the same number of people, such as AIDS. Preventive measures for type 1 diabetes do not yet exist. Conversely, type 2 diabetes, a person can avoid it, and by eliminating from your life all the risk factors for this disease. This means compliance with strict rules in everyday life. The need to ensure enough physical activity, healthy lifestyle and balanced diet (with proportional energy value physical activity). Diabetes is not the result of excessive eating sweets, as many people think, but it is a reaction of the organism to excess consumption of any food. Sweet dishes are diabetic must deny an outbreak of the disease, because of the inability of the body to cope with the processing of an excessive amount of sugar in the blood. The most common symptoms for type 1 diabetes is irritability, frequent urination associated with abnormal thirst, as well as vomiting, asthenia, weight loss and unusually strong hunger. Children may also discover bedwetting. Because carbohydrates are collected in the blood, is missing these energy reserves in the cells and you must gain the power to use fats (lipids). Upon cleavage of fat (catabolism) is also released waste products (ketones, acetone), which increase the acidity of the internal environment, and thereby affect the course of other metabolic reactions. 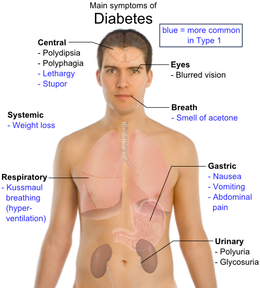 It is therefore also diabetics mouth feel ** ** acetone odor, which inter alia occur together with glucose in urine. Very often can be the first symptom of the disease diabetic coma with impaired consciousness. Type 2 diabetes has symptoms much more, but less so are its symptoms specific. Is often blurred vision, decreased perception of sweet taste, itching, unusual thirst, drowsiness, fatigue, skin infections, slow healing of wounds, leg pain and tingling feet. Often they are also present symptoms similar to flu or colds, perhaps even loss of hair on the legs or yellow bumps (xanthomas) throughout the body. Frequent daytime and nighttime urination is also not uncommon. All types of diseases have a common part of treatment, which is a diet and exercise. Type 1 diabetes is moreover possible without regular supply of insulin. It is administered by injection in the arm, thigh or abdomen about 3-6 times a day. If the blood sugar values fluctuate excessively, it is necessary to use an insulin pump. The insulin reservoir delivers constantly a small amount of insulin into blood, and thus almost completely replaced the function of damaged cells in the pancreas. Patients should have the property in addition to regular insulin doses also instrument meter, which can be measured from a blood drop the current value of blood sugar (blood glucose). Dietary measures include frequent food intake by a small amount (min. 5-6 day courses).Furthermore, it should not exceed the dose of 30 grams of sugar per day and are not recommended products sweetened with sucrose. Regular physical activity should be reasonable, certainly there should be no shortage of blood sugar (hypoglycemia). Therefore, diabetics must never starve for a long time not to practice intensive, long-term activity. While still experimental therapy is the transplantation of pancreas or its cells producing insulin (islets of Langerhans). For type 2 diabetes is usually necessary to reduce body weight and administration of drugs, so-called. Oral antidiabetic agents that enhance the tissue sensitivity to insulin. Physical activity is necessary in order to maintain muscle tone and efficiency, reducing blood glucose levels, controlling blood fats and thus control weight. Among others, the following physical exertion also demonstrated a significant effect in increasing the sensitivity of the organism to drug efficacy. However, if the above-mentioned measures helped to maintain a low blood sugar, it would require treatment with insulin, as in Type 1 diabetes (the same principle applies for gestational diabetes). Among the sudden complications like too low and too high blood sugar (glucose) in the blood. Hypoglycemia (low blood sugar) can have many causes, eg. Hunger, too much exercise, delayed meals, alcohol, and so on. This complication is manifested feelings of hunger, dizziness,palpitations, or confusion. Sometimes even he describes and tingling in the fingertips. If not treated, it can lead to coma and death. First aid in case of hypoglycemia is called submission. Fast sugars (easily degradable), for example. Sweet drinks. In the event that he is concerned in coma, he would get a lump of sugar under the tongue and be immediately treated by a doctor. Conversely, hyperglycemia (high blood sugar) arises in the case of undiagnosed diabetes, omitting insulin doses or in times of illness and stress. It manifests the classic symptoms of diabetes mellitus, and if not treated, it can also lead to coma and subsequent death. Hyperglycemic coma develops very quickly. Since the hypoglycemic him identify the typical signs such as sweaty skin, shallow breathing and the absence of dehydration. The first is using insulin administration. If you are unsure about what kind of coma is, Never give insulin, as in the case of hypoglycemic coma could have a deadly impact! Diabetes mellitus, unfortunately, brings chronic complications due to which every diabetic must undergo further testing in various medical devices. These are mainly the following specific complications: impaired nerves (neurologic examination), retinal disorders (optical inspection),renal impairment (urine test) and small artery disease (vascular tests). For type 2 diabetes are also at greater risk of heart disease and penetration of infection. 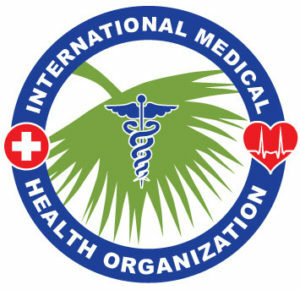 It is therefore necessary to weight control, blood pressure and vascular examination, to avoid development of the emerging disease. Most often in connection with the above mentioned complications encountered with diseases such as: reduced kidney function to their failure, retinal damage, blindness, gray or glaucoma, atherosclerosis, vascular, myocardial infarction, stroke and tingling to pain in the extremities. Furthermore, we can also meet with sores, ulcers, inflammation, and even with the need for amputation of lower limbs. And to make matters worse, affect complications also digestive system, causing indigestion, secretion, and sometimes even gallstones.